RKV Law is pleased to announce that Aspen attorney Ryan Kalamaya has been selected for the Top 40 Under 40 list by The National Trial Lawyers. 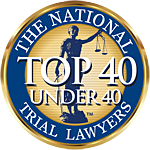 The National Trial Lawyers: Top 40 under 40 is a professional organization composed of the top trial lawyers from each state or regions of certain highly-populated states who are younger than the age of 40. Membership into The National Trial Lawyers: Top 40 under 40 is by invitation only and is extended exclusively to those trial lawyers practicing civil plaintiff and/or criminal defense law. Invitees must exemplify superior qualifications, trial results, and leadership as a young lawyer under the age of 40. Selection is based on a thorough multi-phase process which includes peer nominations combined with third-party research.